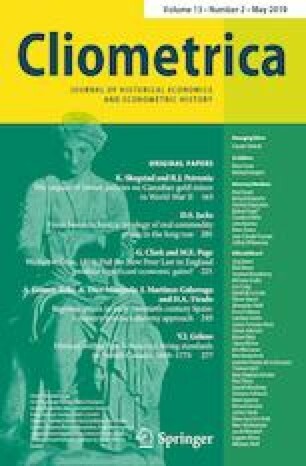 This paper explores regional price variation in early twentieth-century Spain. Using consumer price information from the bulletins published by the Instituto de Reformas Sociales between 1910 and 1920, we build a dataset with a total of 40,581 quotes covering 22 items for each of the 49 provinces. We then estimate provincial price levels following a country-product-dummy (CPD) approach. Our findings suggest that spatial price variation existed across Spanish provinces. In line with the Balassa–Samuelson conjecture, consumer prices and productivity levels were somewhat related. Additionally, it is shown that prices rose in all provinces after the outbreak of World War I. Even more, it appears that this demand-shock brought about spatial asymmetries in price growth. We are grateful to Dolores Añón Higón, Àngela Gallardo, the editor, and two anonymous referees for their advice and suggestions. Funding was provided by Ministerio de Economía y Competitividad (Grant Nos. ECO2015-65049-C12-1-P and ECO2015-71534-REDT). See Figs. 6, 7, 8 and 9 and Tables 5, 6 and 7.